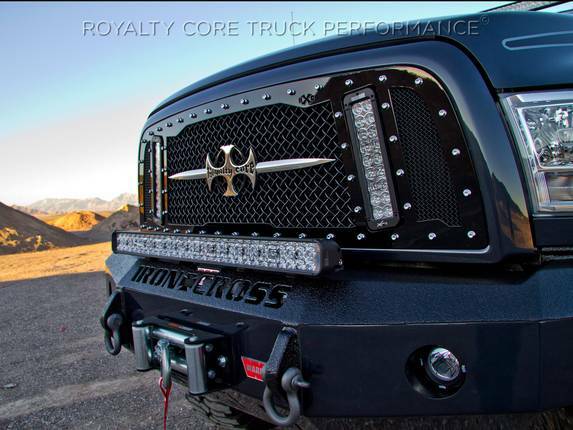 After years of rigorous planning Royalty Core's design team engineered their Explosive RCX grille integrating vertically positioned dual LED light bars with explosive lumen output. Extreme lines, twin mesh accents, and 5.0 Super Woven Mesh create the ultimate grille for your vehicle. This grille includes two insanely powerful Vision X 11.5"" light bars. the market against the harshest conditions. Simple direct bolt on Royalty Core grilles are engineered to exploit the cleanest installation possible for your specific truck model.